The Coastal Retreat Beach Cottage is located at the Rookery, has recently been professionally decorated and furnished with care and detail. Snowbirds welcome. GPS address is 5601 Hwy 180, Unit 2701, Gulf Shores, AL. The Master bedroom has a King bed, the second bedroom features a Queen size bed, and the third bedroom has 2 sets of bunk beds. The Rookery development is located at mile marker 6, which is 14 miles down Fort Morgan Road from Gulf Shores. The Rookery was designed to be a natural and quiet resort and is located adjacent to the Bon Secour National Wildlife Refuge. This is a wonderful place for families to swim, play and explore. The complex has two pools: a large, zero entry pool with a tiki bar and a smaller one on the left as you enter the complex. The pool facility also has restrooms as well as an outdoor jacuzzi. The pools are heated beginning March 1. Around the pool, you will also find public charcoal grills as well as a tennis court. Public beach access is across Fort Morgan Road. Turn right leaving the Rookery, go 1/2 block and turn left on Cortez. The beach is straight ahead. Total distance is approx equivalent of three city blocks. A marina, boat dock, and restaurants are located nearby. There are nature trails for walking and hiking, as well as a bike path. We accept electronic bank transfers and credit card payments through VRBO and other forms of payment through PayPal. MUST BE 25 YEARS OLD TO RENT THE COTTAGE. Our Family is from Texas. 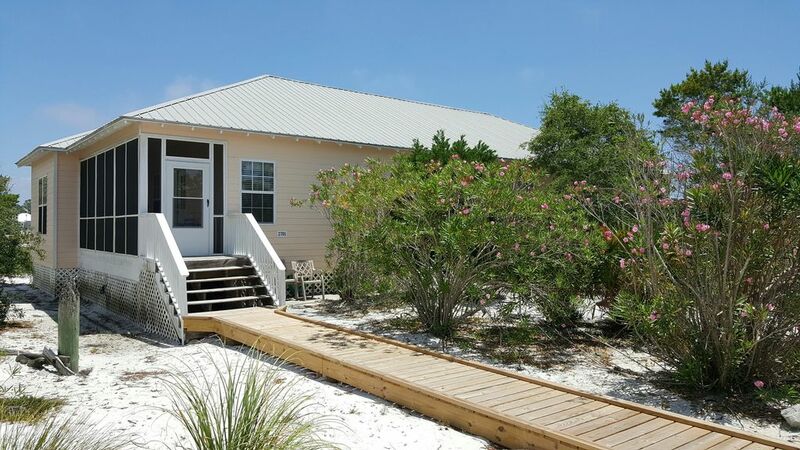 We bought The Coastal Retreat Beach Cottage because we love the Gulf Shores area and like to get away from the hustle and bustle but also be close to the action if we choose. We also love having the pool when we get tired of playing at the beach. We have the best of all worlds. We have lots of pool and sand toys stored away for the kids. Kiva Dunes and Peninsula golf course nearby. The owner is so nice and helpful! This is our 2nd time staying here and we love it! The closeness to the pool and the beach is great! We definitely want to stay again! We loved it!! Great house and location. The weather could have cooperated a little more but all in all it was a great time. Thanks for sharing your house with us! Upon arrival we were pleasantly surprised at the quality of furnishings. Furniture appeared to be brand new, and the cottage was nicely decorated. The only thing I could suggest would be the kitchen utilities. There were plenty of dishes but were lacking on pots and pans, measuring cups and silverware. Although there were only two of us staying in the cabin, we still were cooking daily and found it difficult to find a pan with the proper lid or casserole dishes of any kind. This cottage was clean and beautifully kept. Would definitely recommend to any of our friends, Thank you for your hospitality. This rental is perfect! Everything you need. 2nd time we have stayed at the rental. We love it. So close to the beach and very private. Clean, comfortable, cozy, and safe area. If you are looking for a kid friendly place to stay this is the place to be. It has an enclosed porch for the kiddos to play. The swimming pool is within walking distance. A shower outside to wash off the sand before entering the cottage. TVs with satelite in all bedrooms. Very comfortable and cozy. This beach cottage had everything you could need for a week long stay. From the kitchen to the bedrooms to the living area the owners thought of everything. It's in a great location, easy route to the beach, and secluded enough that you're not crowded like in a high rise condo. The cottage was clean and beautifully decorated. I communicated with the owner several times and he was always helpful and informative. My family and I had a fantastic week and highly recommend the coastal retreat. Thank you Tom. Hope to have you back! Rates are subject to changes until rates are confirmed.